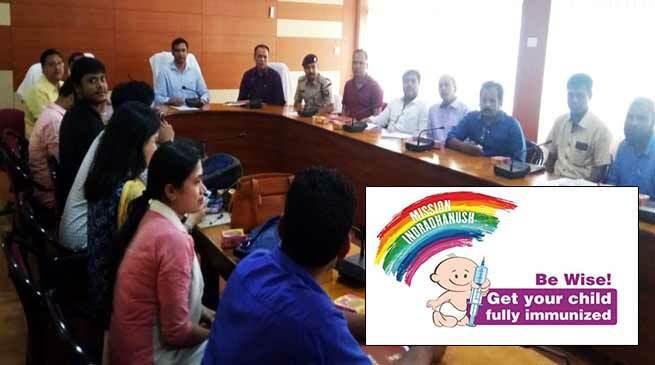 The first round of Mission Indradhanush (MI) under the extended Gram Swaraj Abhiyan will be focused in the inter-state and inter-district border areas of Hailakandi district of Assam . This was decided in a meeting of the District Task Force on MI here on Wednesday under the Chairmanship of Deputy Commissioner, Adil Khan. Khan stressed on vaccinating children in the remote areas and those living close to the inter-state and inter-district border. “Focused and systematic immunization drive has to be carried out in the interior and border areas in a campaign mode where the aim is to cover all the children who have been left out or missed out of immunization,” said Khan to the health officials and functionaries. These are the pockets with low coverage due to geographic, demographic, ethnic and other operational challenges. Evidence has shown that most of the unvaccinated and partially vaccinated children are concentrated in these areas. The Deputy Commissioner underscored the need for monitoring and supervising the vaccination drives at the district and block levels. “Monitoring has to be strengthened at district and block levels to ensure coverage in hard-to-reach areas of the district,” said Khan. The health officials asked the in-charge of Block Primary Health Centres (BPHCs) to lay emphasis on Adverse Event Following Immunization (AEFI) cases. The meeting fixed the submission of Action Plan for each BPHC by July 9. MI was launched in December 2014, to drive vaccination against TB, poliomyelitis, hepatitis B, diphtheria, pertussis, tetanus and measles, in 201 districts that had very low immunisation coverage. By July 2017, 2.55 crore children under two years of age and 68.7 lakh pregnant women had been covered in 528 districts across the country. The Centre also launched the Intensified Mission Indradhanush (IMI) to reach 90% immunisation in 173 districts by December 2018. By July 2017, 2.55 crore children under two years of age and 68.7 lakh pregnant women had been covered in 528 districts across the country.